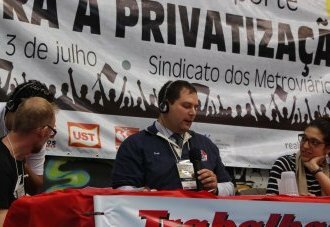 Chicago CTA bus driver and elected Executive Board member of ATU Local 241, Erek Slater, represented his union at the July 1-3, 2016 Transport Workers International Meeting Against Privatization in São Paulo, Brazil. This became an opportunity to also meet São Paulo Metro Workers Union militants who participated in the big, internationally-followed transit workers strike of 2014, and with the Metal Workers Union of Sao Jose dos Campos, which carried out this past year several strikes including a sit-down strike. In the midst of the hype for the Brazil Olympics, here is class struggle union journalism : meeting strike leaders from Africa and Europe, comparing Chicago transit working conditions with Brazilian transit workers as they arrive for work at bus terminals, and visiting the vice president of a 38,000-strong metal workers union who is an openly militant socialist. Included is a quick look at São Paulo’s transit system.